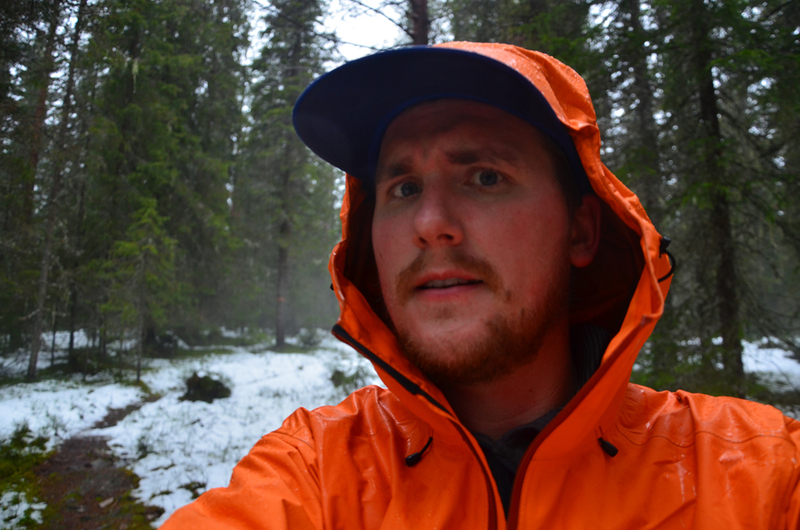 Few days ago I was super excited about going to Dalarna in order to hike the 90 kilometres of the Vasaloppsleden. I packed my usual kit in my HMG ice pack and I was good to go. I wanted to be fast and light. My goal was to complete the trail in 3 days, 30K per day. Tight with the already short days but largely doable. 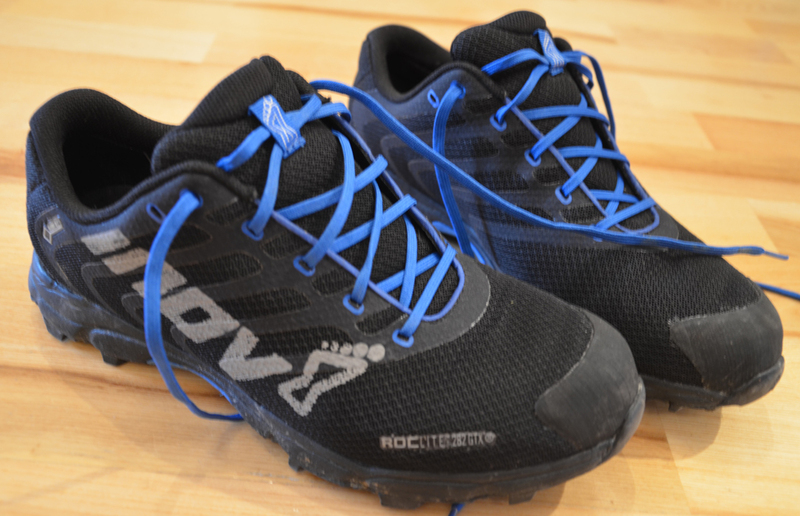 In terms of footwear I decided to use the Inov8 Roclite 282 GTX. I wanted some very light shoes that would allow me to be very fast and very precise. I also wanted waterproof footwear because I knew I would encounter some rain on the trail. 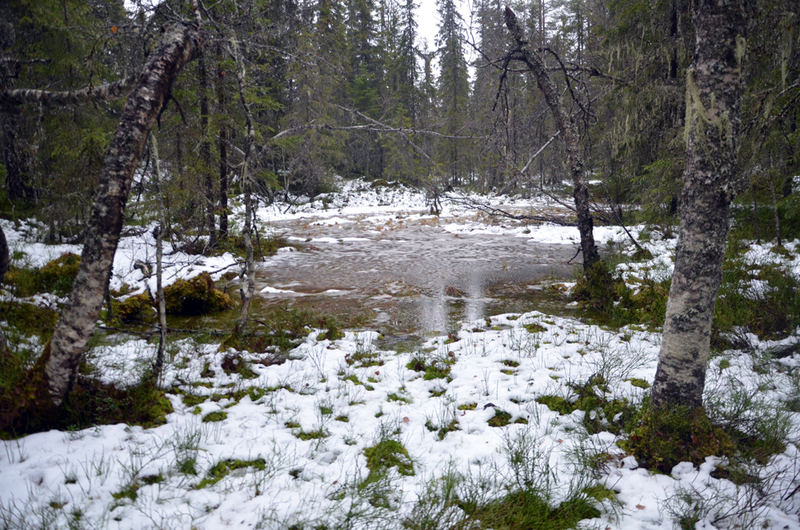 Wet feet usually don’t bother me but the scandi fall can be pretty cold sometimes. I was all set and ready to hit the trail. I took a train and a bus from Stockholm to get to the start in Berga, Dalarna. It’s a long journey, almost 6 hours. 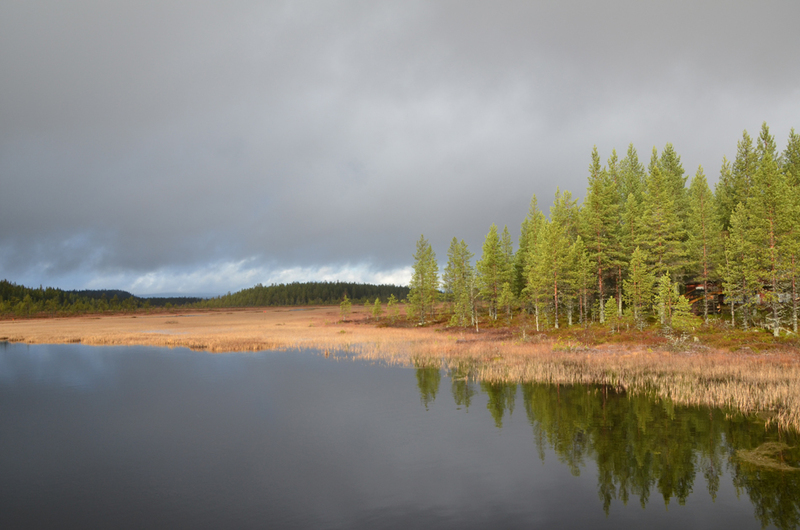 During the ride to Berga I was amazed by Dalälven river which runs along the road. I remember this river from a trip I did with Natasza a year and a half ago, we packrafted the very end of Dalälven and loved it. I arrived in Berga under a pounding rain. There’s a parking lot, some toilet facilities and a few picnic tables. I ran to the bathroom to put my waterproofs on (pants and jacket) and started to walk straight away. As expected, it was raining. A lot. A lot a lot. And there was snow aswell, and that was unexpected. 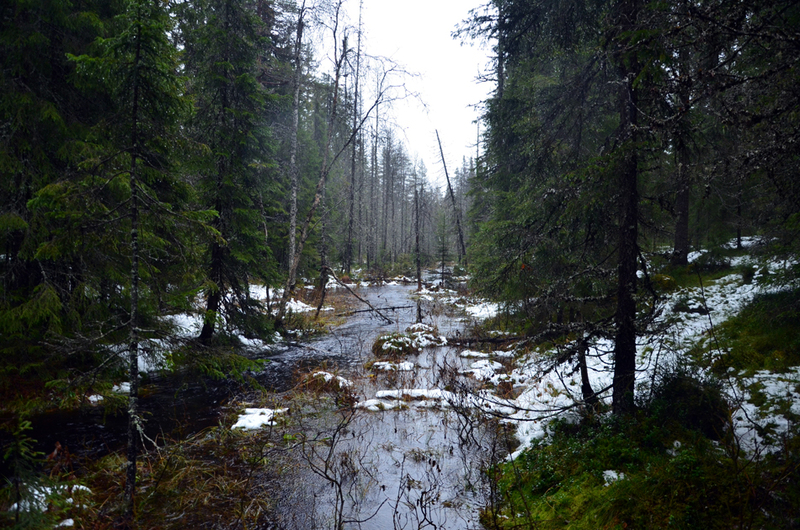 In fact I was walking in wet snow and on a swamped trail. At some point I had cold water above the ankle and I was on the trail, which means a bit higher than the actual swamp I was going through. The trail was flooded and I was soaked. I was trying to look on the bright side : I was in a beautiful forest, just by myself and was there to enjoy it. 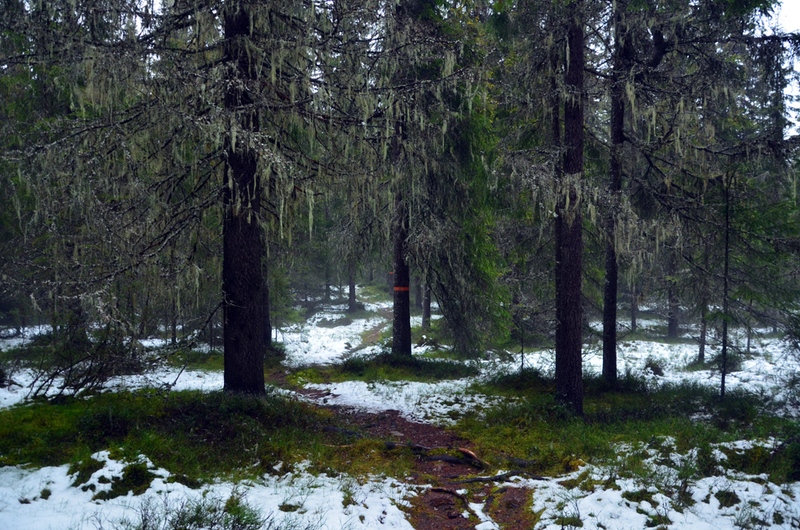 The nature is breathtaking in Dalarna, it’s very wild (I was following linx footprints – and droppings- on the trail) and it really looks like old forests. That’s a part of Sweden I really love. But it was like flashes in my head : I was enjoying the place for a second and then the moment after I was finding myself struggling in a muddy mix of dirt, rotten wood and leafs. 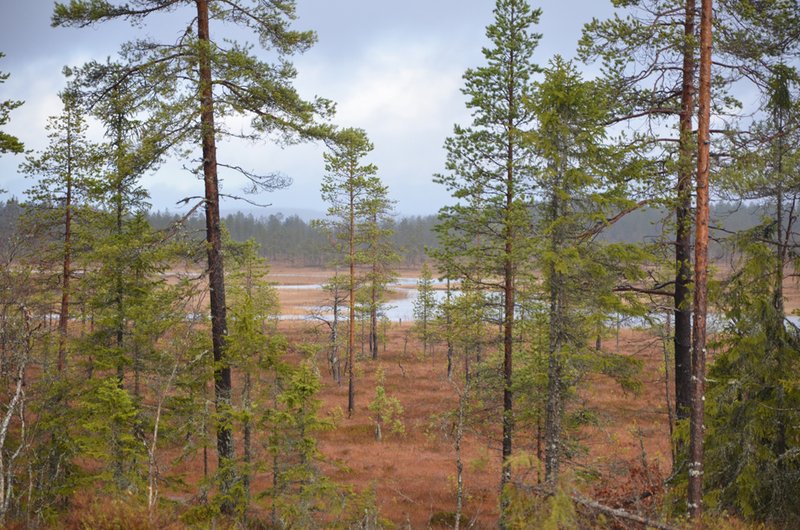 I felt like Frodo and Sam in the middle of the Dead Marshes, except it was colder where I was. Okay Frodo and Sam walked barefoot, but they’re hobbits for God’s sake and I’m not ! 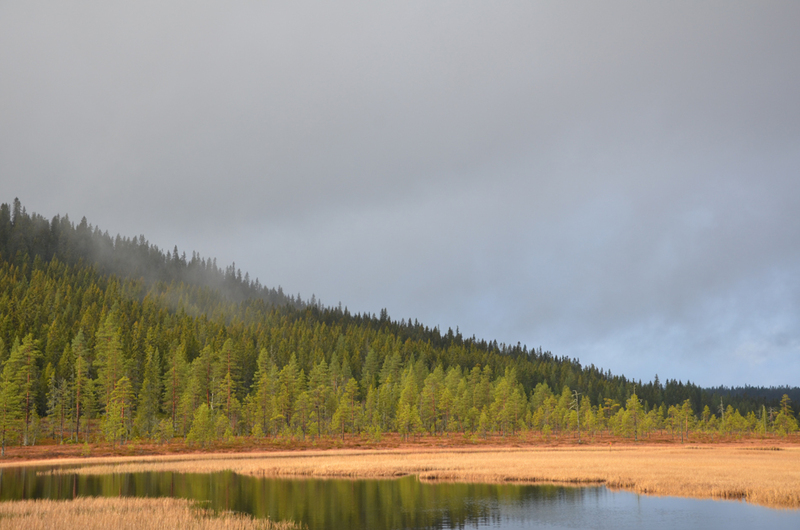 Well Dalarna is not Mordor either but you know how your brain can create some weird conections sometimes. It rained all day. I wanted to sleep in my Duomid but there was no way I would find a decent place to pitch it and dry my clothes. So I crashed in a cabin for hikers. There are eight cabins along the trail and this one saved my night. It rained all night. The next morning I was fresh and ready to go on and walk the 30K as planned. Then I opened the door. The weather was even worse. I was in front of a rain curtain and the sky was all dark, saturated with massive clouds and it was pretty windy aswell. I was devastated. I stepped back into the cabin, sat down to think. What should I do ? 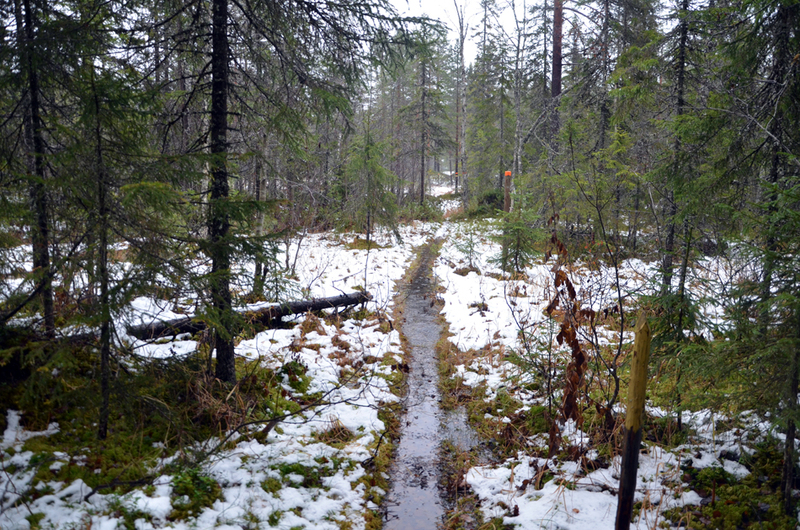 There was one possibility : ignoring the rain and pushing to the next cabin. But I was running out of time (in a few days Natasza and I are flying to Latvia) and could not afford walking less than –at least- 25 km a day. I grabbed my phone and called Natasza to ask her to find me a ride out, what she did. Disapointed, I took the same trail I walked the day before and headed back to Berga. I learned an important lesson this day : I have to be more aware of the weather conditions. Not only the current weather or the weather to come, but also the weather before my arrival. And I should not stick to the forecast. If I did, I would have seen that it was snowing the day before I arrived, I would have chosen another footwear for the purpose and I guess I would have been to the end of the hike. It’s disapointing but I really feel like I learned something here. When I was hiking out I was thinking of the number of different boots and shoes I have back home and how many of them would have done the job. But that’s the way it is. It’s not the firs time I make mistakes and certainly not the last one either. On the plus side I loved the area and I spotted some nice rivers that will totaly fit for a future packrafting trip. In other words, I’ll be back, Vasaloppsleden ! Hello, I just wondering what kind of boots could have done the job. certainly not leather boots. so what would you had taken? well, if I was to do it again under the same conditions, I would take the Salomon X ULTRA MID GTX I guess. They’re lightweight and they dry fast and yet they’re waterproof. I try to avoid waterproof footwear as much as I can, I don’t mind the wet feet but when it’s cold it’s different. Leather is a real pain to dry overnight, so I wouldn’t have taken some leather boots. My mistake here was not to use ankle boots.